I’ve always loved cherries and cherry flavored foods. I can always remember wanting cherry cake or pie if asked what dessert that I would like. I also used to pick tons of cherries from my parents cherry tree. You had to be fast though because the birds would get them before almost anyone! I will never forget climbing up that ladder and picking cherries so that my mom could make something delicious. I love memories like that! Somehow most of my fondest memories have to do with food in some way. I’ve always been a foodie every since I was a little girl. I knew that I liked to cook and help my mom in the kitchen. Although I will admit that I was never too fond of helping in the garden. No one likes to pull weeds, lets be honest! I did really enjoy eating the vegetables from the garden though! Anyways, back to my cherry obsession! I tend to get off track every now and then. So, I love cherries and I loved chocolate. I really love to combine the two. I found this recipe and it is amazing! 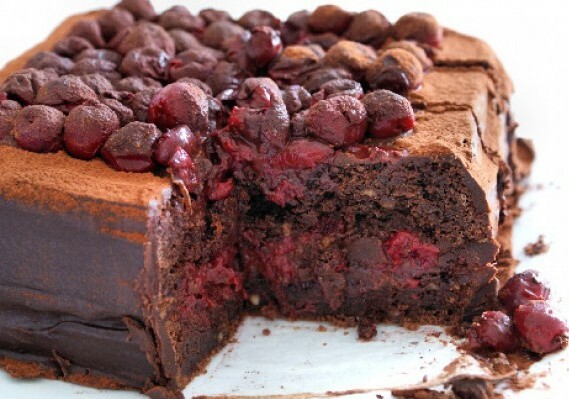 It is the most decadent chocolate cherry cake I have ever tasted. If you are a fan of these two wonderful ingredients then you will love this cake. This is the kind of cake that makes you feel so good and perhaps a little dangerous! Recipe and photo credit courtesy of The Answer Is Cake. Quick Tip: Mix in raspberries with the cherries for an even yummier taste!